Animal lovers and their furry friends howl in delight! Vancouver’s Loden Hotel and its sister restaurants, Tableau Bar Bistro and Homer St. Cafe and Bar, are putting their best paws forward and supporting the BCSPCA with a new Pooch Package and a weekly treat fundraiser called “Woof Wednesdays.” To raise campaign awareness in hound-like form, the Loden’s famous London cab has been lovingly re-born as “Baxter the Beagle,” and can be spotted sniffing around Vancouver and offering both two and four-legged guests memorable rides for the month of September. Starting today, “Woof Wednesday” treats will be available by minimum donation at the Loden, Tableau, and Homer St. Cafe. Dog owners themselves, the delectable dog biscuits are made in house with love by Executive Chef Marc-André Choquette (Chef MAC) and house Chef Tret Jordan, and are, quite simply, drool-inducing. The bone shaped “Peanut Butter Bacon Biscuits” are sure to drive doggies wild, while the “I Love Lamb Treats” will certainly have canines and their owners coming back for more. All proceeds from the treats will benefit the BCSCPA, but dog lovers shouldn’t delay, as the special snacks are only available on Wednesdays for the month of September. Taking its cues from Chef MAC and Tret’s decadent treats, the Loden’s Pooch Package also launches today, and offers both pets and their owners an equally luxurious home away from home experience while raising money for animals in need. Beginning with a personalized in-room door sign, special turndown treats, and a choice of doggie bed size, pets are sure to feel extra special upon arrival. Followed by a visit to a pet spa service, local adventures via the Loden’s very own dog walking map, and “walks” with Baxter and his fuzzy ears, nose, tongue and tail, the Loden Pooch Package makes for a stay guests and their canine companions won’t soon forget. When it’s time to pack up and say goodbye, each guest will leave with their own copy of Modern Dog and the knowledge that a $20 donation has been made to the BCSPCA. As a pet-friendly hotel with a soft spot for animals, “Woof Wednesdays” and the Loden’s Pooch Package are the latest in a series of fundraising efforts the hotel and its sister restaurants participated in this year in support of the BCSCPA. In August, the Loden Hotel’s Lilliana L. De Cotiis was locked in a cage for the BCSCPA’s Celebrity Rescue event, where she single-handedly raised $11,205.00 for animals in need. Earlier in September, the team from the Loden, Tableau, and Homer St. Cafe proudly marched in the annual Scotiabank and BCSPCA Paws for a Cause flagship walk to end animal cruelty in Stanley Park. The team’s volunteers —as a group of animal lovers—also facilitated a beautiful BBQ as a fundraiser at the walk. 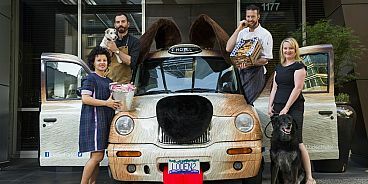 The Loden Pooch Package begins at $449 and includes: Loden Signature King accommodation, transportation in the Loden canine cab (arranged through concierge as available), a copy of Modern Dog, special doggy treats, choice of size for the doggy-bed, a pet spa package and a $20 donation to the BCSPCA.